The Kentucky Equine Management Internship (KEMI) program is dedicated to improving the opportunities for college students wishing to pursue a career in the field of equine management. KEMI offers a comprehensive educational experience for students enrolled for academic credit through a sponsoring college or university, or for recent graduates of such institutions. Through the internship, students integrate academic studies with practical experience, leadership and responsibility as a contributing participant on a Central Kentucky horse farm. 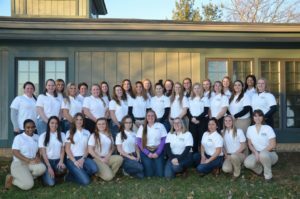 Aside from farm commitments, students are introduced into a network of equine professionals representing multifaceted careers in the equine profession. During the first week of the course, students participate in Orientation activities as a group. After the first week, students are employed full-time by participating farms where they become familiar with the day-to-day management of horses on commercial thoroughbred farms. © 2019 Kentucky Equine Management Internship. All rights reserved.